Hello there! Apologies for my absence. Half-term appeared and then whizzed by myself and my 3 tinkers like a whirling dervish! Now that we are back to some sort of normality and routine at home, I can crack on with all things ‘Whimsy Wood’ and book-related! So, what’s been happening in the world of children’s books this week? Well, most importantly it’s National Bookstart Week. This is the BookTrust’s annual event, which aims to celebrate the joys and benefits of sharing books and stories every day. Each year, a theme is chosen to excite families and this year’s theme is ‘under the sea’! 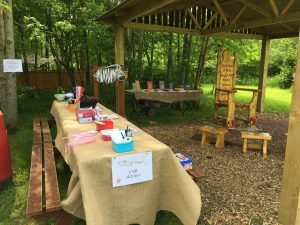 Not only has book 9 been receiving its finishing touches, but we had a wonderful ‘Whimsy Wood’ event on Saturday the 28th of May, at Hope Nature Centre in Southwick Country Park, Trowbridge, Wiltshire. My Whimsy Wood Series and I were invited to run a treasure hunt in their ‘Fairy Forest’ and whimsical craft activities. These ranged from ‘dressing up Dr Tustle the Tawny Owl in exotic feathers’, to creating ‘Skittle Spider from fir cones’ and many more activities in between! The Whimsy Wood craft table ready to go at Hope Nature Centre’s 10th birthday celebrations! 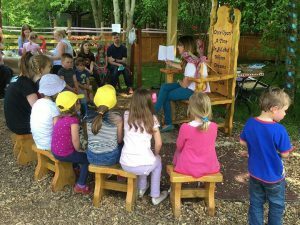 I was also asked to read the latest book, ‘Fearne Fairy And The Dandelion Clocks’, to all the children, parents and grandparents that came along to Hope Nature Centre’s ‘Family Fun Day’, as part of their 10th birthday celebrations on May the 28th. Now, I don’t think I’m alone here, when as a writer I run out of exciting ideas for my ‘Whimsy Wood’ children’s books, or I generally lose a bit of my writing spark. This week I’ve certainly been out of sorts and rather restless. Making myself sit down at the computer or my notepad to write, has been near-nigh impossible! 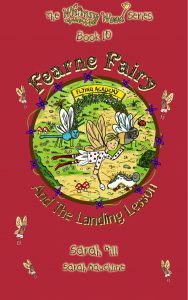 “In this day and age, it’s lovely to be reminded of an innocence and a gentleness that seems to have been retired to the bygone age of Enid Blyton, and this book very much has the feel of the Magic Faraway Tree to it. In this, the eighth book in The Whimsy Wood Series, we meet Fearne Fairy who lives in a moss-covered tree stump in the middle of Whimsy Wood. Fearne likes to sing, even if she’s not always very good at it, and fly, but is hopeless at landing! 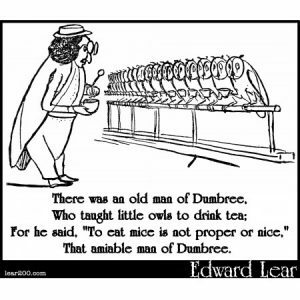 Well hello there and a happy National Limerick Day to you! Today, being the 12th of May, is actually the birthday of English artist, illustrator, author and poet, Edward Lear (May 12, 1812 – Jan. 29, 1888). This amazingly talented fellow is known mostly for his literary nonsense in poetry, prose and limericks. Today is the sort of day that I have, “Oh Happy Day! 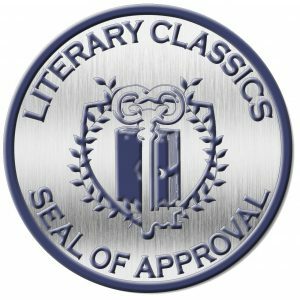 Oh Happy Da-a-a-y!…..” sung by a gospel choir, (such as the one with Lauryn Hill in Sister Act 2), buzzing around my head on some sort of jubilant loop! 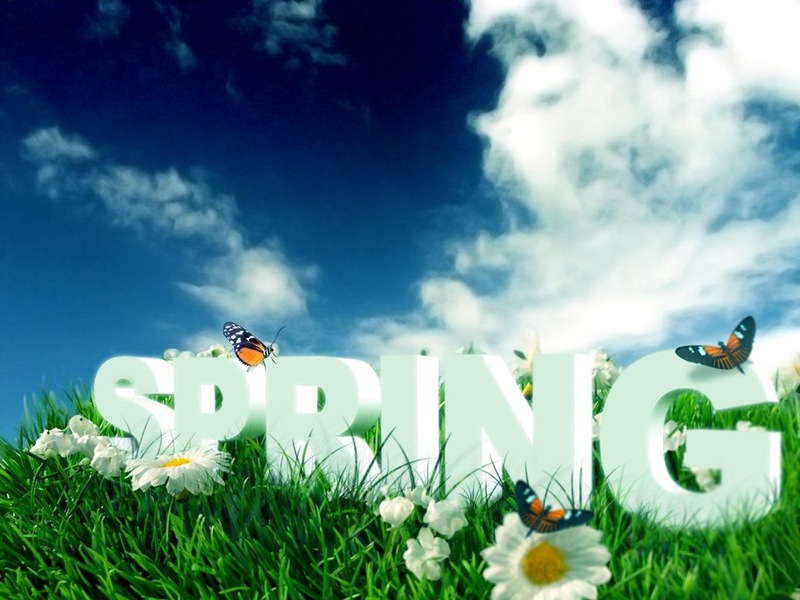 In the words of my current Whimsy Wood main character, ‘Fearne Fairy’, “Spring is here, the flowers are out. The birds are tweeting all about!” Indeed she’s certainly right! For where I live, in the beautiful rolling countryside of Wiltshire, (a place, that to me, is the nearest thing to Tolkien’s ‘Shire’ that I will ever find), the sun is certainly shining, birds are tweeting and bees are buzzing busily about. 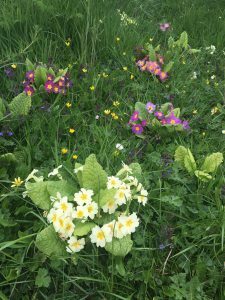 In ‘Whimsy Wood’ itself, the day seems to be rather similar, with the primroses and celandines still currently in bloom and ‘Bristle Bumblebee’ is incredibly busy, flitting between these fabulous flowers. ‘Mrs Scarlet the squirrel’ has been feeling rather ‘continental’ this week, with the weather being so balmy, as she’s taken to closing ‘The Woodland Store’ between 12 and 2pm for an afternoon siesta! Well, why not indeed?! The young woodland folk have been dashing off to ‘Snapdragon Stream’, once their lessons at ‘Sycamore School’ have finished for the day; while ‘Mr Bilberry the blackbird’ (Whimsy Wood’s postman), has been catching forty winks in a sunny spot by the bluebell patch, between his morning and afternoon postal deliveries! Ok, so it may not come as a huge surprise to you, when I say that the untangible commodity called ‘imagination’, that we all have, is my most favourite thing in the whole wide world. Your imagination, costs nothing to obtain and use. 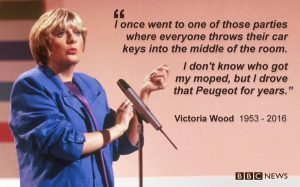 You can take it anywhere and everywhere and you can use it whenever you fancy. It also happens to be my ‘right-hand-man’ so to speak, when it comes to writing my ‘Whimsy Wood’ children’s series. Like anything that you use all the time, you can take such things for granted. 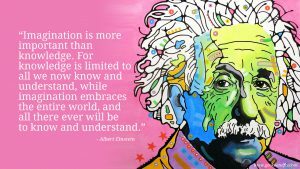 I am no exception to this, as I sometimes forget how truly remarkable our imagination is. That is until I am invited into a primary school and interrogated about all things writing-related, by thirty-five keen and eager children! A particular reminder of the power of imagination, happened to me yesterday afternoon. 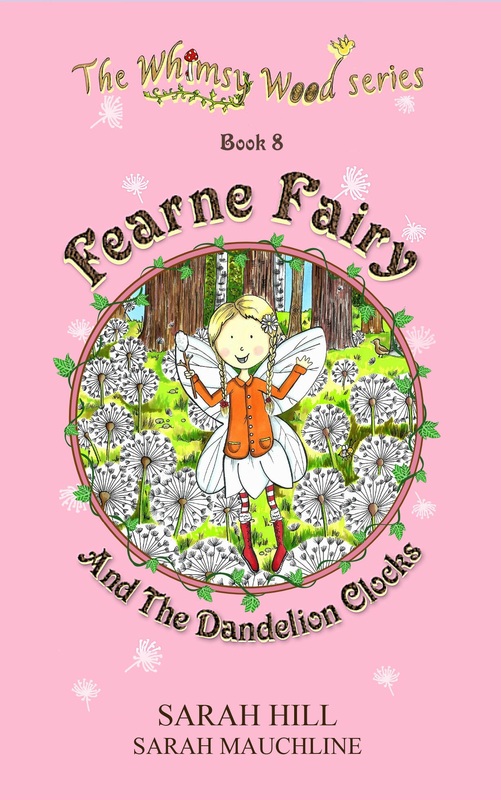 I was fortunate enough to be invited into Ogbourne C of E Primary School in Ogbourne, Wiltshire, to read ‘Fearne Fairy And The Dandelion Clocks’ (book 8 in my Whimsy Wood series), to all their key-stage 1 children. Some mums and dads also popped in to hear the story, which was lovely. Within this whimsical story, there happens to be a tongue-twister of sorts…..’super special, sore-head fixing, dandelion drink’, is the particular tongue-twister in question and it works especially well when there is audience participation! I’m delighted to say, that the Ogbourne Primary School children did not disappoint with their efforts and enthusiasm, where this mouthful of a sentence was concerned! Following the story, there came a round of questions from these bright and lively children. 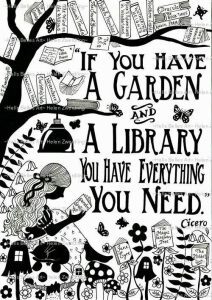 All of which happened to be related to writing books and my ‘Whimsy Wood’ children’s series, which was a relief! Occasionally, children will throw you a curved ball question such as, “Why are you wearing that today Miss?” or, “My name’s Ben. Did you know that?” These random questions always tickle me and it’s this wonderfully free, almost left-field way of thinking, that I love about working with children! This week has seen the 400th celebration of the world’s most famous bard. This is of course William Shakespeare, without whom we wouldn’t have the huge array of plays, well-used sayings, or indeed vocabulary that we have today. My favourite Shakespeare play would have to be ‘A Midsummer Night’s Dream’, so with this in mind, here’s a wonderfully whimsical and fairy-filled extract! ~ William Shakespeare, A Midsummer Night’s Dream. As for news from the world of ‘Whimsy Wood’, well we’ve been busy little bees as usual. 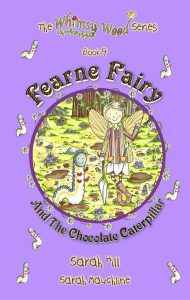 Work has started on the production of my 9th Whimsy Wood book, ‘Fearne Fairy And The Chocolate Caterpillar’, which is very exciting! 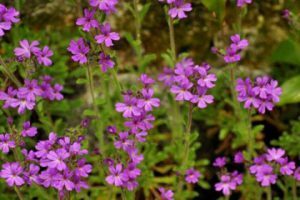 This book is written for this current month of April, so you’ll read about Fearne’s ‘brilliant white bindweed umbrella’, vibrant violets, beautiful bluebells and ‘fairy foxgloves’ amongst other things! 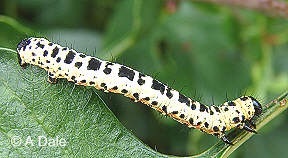 Meet ‘Mustard the Magpie Moth Caterpillar’! Well, I’d better get on and be creative elsewhere, so I shall bid you farewell and wish you all a wonderfully whimsical weekend! I bet you’ve been wondering what the Whimsy Wood folk have been up to over the Easter holidays? Well, along with the annual Easter egg hunt that always starts and ends at The Woodland Store, there’s been a spectacular Easter bonnet parade, which was held in the bluebell patch by Mrs Bramble’s burrow! Below, you will see the bluebell archway that was the entrance to Whimsy Wood’s Easter bonnet parade! 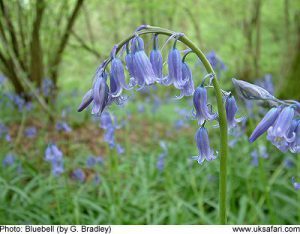 There are bluebells dotted throughout Whimsy Wood at this time of year, but they seem to grow in abundance in this spot by Mrs Bramble’s burrow! I’m guessing it’s something to do with all the carrot peelings that she digs back into the ground around her burrow?! There was such an amazing array of beautifully decorated hats, that Mrs Spottisdowne the sparrow struggled to pick a winner for the ‘Best Bonnet’ competition. In the end, she chose Winona Wren’s violet-themed extravaganza of a hat! This creation was so big, that Winona couldn’t fly with it on her head! Instead she had to instruct a team of ants to carry it along to the Easter bonnet parade for her! When I look back at the start of this marvellous month of March, I can barely believe how much my ‘Whimsy Wood’ children’s series and I have achieved. We were invited to numerous primary schools and nurseries up and down the country, as part of book week. I was also asked to judge a children’s writing competition in the middle of the month, as shown in the top photo. 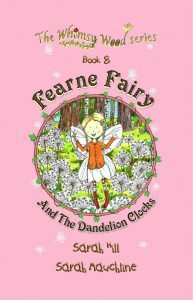 Book 8, ‘Fearne Fairy And The Dandelion Clocks’, was launched on Saturday March the 19th. The wheels of ‘Whimsy Wood’ were back on the road again last week, as I was invited to visit Townsend Barn Nursery in Poulshot, Wiltshire, to read ‘Posie Pixie And The Pancakes’, book 7 in my Whimsy Wood children’s series. Visiting Townsend Barn Nursery in Poulshot, Wiltshire. The 1st Hardback And Paperback Copies Of Fearne Fairy And The Dandelion Clocks! I was also invited to Hamp Academy in Bridgwater, Somerset last week, to run 2 creative writing workshops for their junior pupils. We had lots of fun, creating woodland story arcs in the form of game boards. The children were then able to write a short woodland story, using their story game boards. This tied in with a woodland visit the children had been on a few days before. Along with a treasure hunt around The Little Hen House, the children were treated to a ‘pin the beak on the chicken’ game and craft activities. Following some essential celebratory slices of cake, the children settled down to hear the first ever public reading of ‘Fearne Fairy And The Dandelion Clocks’! The mention of dreams has just reminded me, that I really should be finishing off the content required for Whimsy Wood’s new website, which will go live this Sunday! So, I shall bid you farewell and wish you a wonderfully whimsical week!